Top Qualities of a Great Restaurant Waiter! Restaurants are usually judged by the services they provide to their guests. 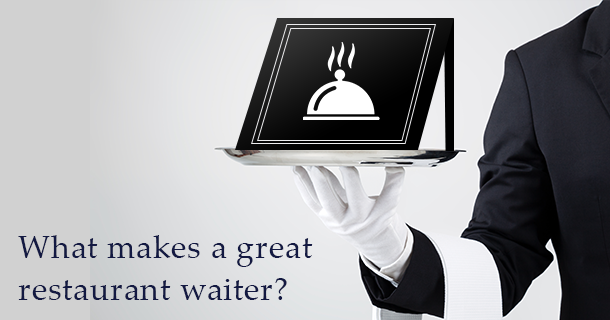 Needless to say, most of the times, waiters are the first point of contact for guests. Hence, it is significant for them to manifest both professionalism and an air of dexterity. Waiters are the face of a restaurant. So, it is of utmost necessity that they are dressed in the most appropriate attire. Shabby, creased or stained uniform could be displeasing to the diners who are come to the restaurant to enjoy good food in a hygienic eRestaurant business depends a lot of the quality of waiting staff, they are face of a restaurant. So, it is of utmost necessity that offer a great service to your guests.nvironment. Thus, waiters need to neat, tidy and presentable to the guest, because the first impression is the last impression! An ideal waiter is one who is punctual about his shift timings and is always present at the at the work station prior to his shift. This discipline and punctuality directly reflects the core values of the eatery. While interacting with the guests, an ideal server always uses docile terms for addressing such as sir, ma’am and miss with a pleasant smile on the face. The response to customer’s questions needs to be gentle, accurate and polite. Silent laughs, snickering and side table remarks might not be taken well by the guests. The waiters who have the habit of inspecting food before serving saves everyone around from a lot of undesired drama, especially when there are special requests involved. A humble waiter always accepts and informs the guest if the orders have been messed up and apologizes for any additional delay. After the order is served, a good waiter always keeps checking on the table he serving, from an adequate distance respecting the guest’s personal space. Ideally, he has to be vigilant about sitting arrangement of the guests, filling up empty glasses, cleaning up some unexpected spilling on the table and be there near the table if the guests need to place some more orders after finishing a course. A worthy waiter will always ask whether the guest is done with dining before taking away the dishes from the table. If there is some food still left in the dish, he can courteously ask if the food was all right. The table has to be cleared promptly, but not without asking the guest. A smart waiter will ask if there is anything more he can get for them, opening the avenue for the guest to order for desserts or juices. When the guests are about to leave after their meal, the waiter must never show his eagerness to receive a tip from them or even mention about it, unless asked. If they have placed the tip on the table inside the invoice folder, it is important that the waiter is patient enough not to clasp or check the amount before they leave. Restaurants have to be highly selective when hiring their staff especially the waiters as they are in direct touch with guests. In today’s era, it is not sufficient to know how to take orders and serve food. Guest look much beyond that in terms of personalized and efficacious services from restaurants and it is majorly upon the waiter’s shoulders to meet or exceed these expectations.